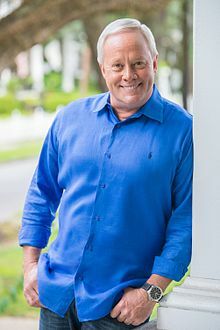 Danny Lipford (born May 29, 1957) is an American contractor and television personality known to audiences as Host and Executive Producer of the nationally syndicated home improvement television and radio shows, Today's Homeowner with Danny Lipford, and for his appearances on The Weather Channel, and CBS's The Early Show. He is also the spokesperson for Menards. Lipford was born in Marianna, Florida. At the age of 9, Danny got the home improvement bug and bought his first tool, a jigsaw from a mail order catalogue. He moved to Mobile, Alabama in 1975 to attend the University of South Alabama but his side job as a handyman turned into a full-time passion. In 1978, he started his remodeling business, Lipford Construction, which celebrated its 30th anniversary in 2008. In 2000, Lipford joined The Weather Channel as their home improvement expert. In daily short segments broadcast throughout the week, he offers advice and guidance on a variety of home topics. Each Saturday morning he also hosts Menards Project of the Week, highlighting the designs, materials and decisions that are involved in a variety of indoor and outdoor projects. Lipford also covers weather-related home topics for the Weather Channel including hurricane preparation tips, and recovering from a tornado. He has also appeared live from across the country for special first day of the season broadcasts from Traverse City, Michigan, Fish Creek, Wisconsin, and other locations. Lipford has been the home improvement contributor to CBS This Morning, and its predecessor, The Early Show, for over a decade. In short segments, he demonstrates a variety of how-to projects in the studio and on location and has appeared live from the floor of industry trade shows including the International Builders' Show and the Kitchen and Bath Show. Lipford has also demonstrated spring cleaning tips on LIVE with Regis & Kelly, moderated "Thermostat Wars" on The Rachael Ray Show and shown how to hang Christmas lights safely on Inside Edition. He has been a resource for magazines and newspapers ranging from Parade magazine to the Chicago Tribune. Lipford's career as the spokesperson for Menards began in July 2018, along with his daughter Chelsea and Best New Products host/former Price is Right model Amber Lancaster, replacing the late Ray Szmanda.